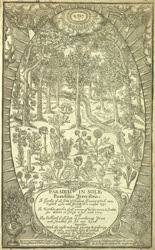 This is John Evelyn’s own copy of one of the best known: ‘Paradisi in sole paradisus terrestris’, published in 1629 by a London apothecary called John Parkinson. Since the word ‘paradise’ comes from the ancient Persian for an enclosed park, the Latin title of Parkinson’s book translates as a pun on his name: ‘The earthly paradise of park-in-sun’. The frontispiece shows Adam and Eve tending a lush Garden of Eden in which they are dwarfed by exotic flowers. In the middle distance is a plant unlikely to be found in any apothecary’s garden: the Sheep of Tartary. Also known as the Borametz, this mythical hybrid of plant and animal grew on an umbilical stem and bore a fruit like a melon. The fruit burst open to reveal a lamb with fleece of the purest white. The legend goes back to classical antiquity and probably has its origins in the ‘wool-bearing tree’ described by Plato - known to us as cotton.